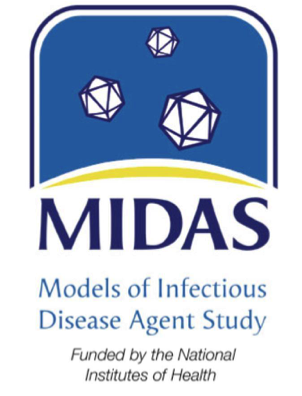 I am broadly interested in the spatiotemporal population dynamics of disease. Specifically I am interested in why childhood diseases occur seasonally, and what mechanisms drive those patterns. A potential mechanism of disease seasonality that I felt had not been adequately covered in the literature was human birth seasonality. My co-authors and I explored human birth seasonality (below) and its relationship with childhood disease dynamics (explained in the Childhood Disease section). 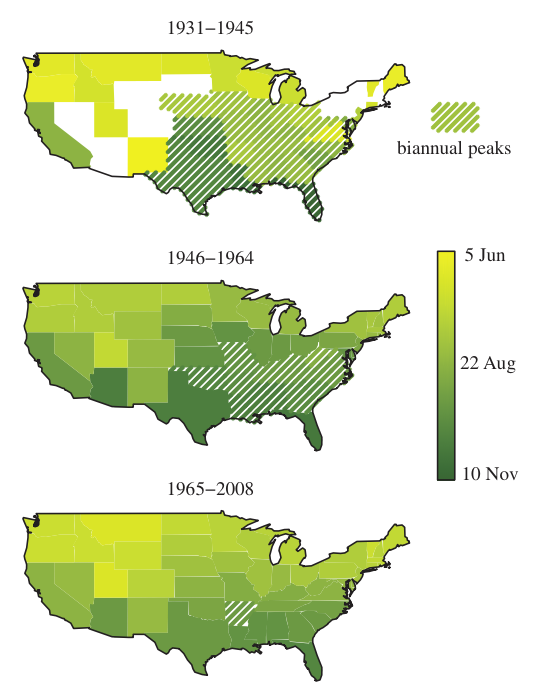 Above: Spatio-temporal patterns of seasonal birth peak timing in the US through the pre-baby boom (1931-1945), baby boom (1946-1964), and the modern era (1965-2008). Colors indicate the mean timing of the birth peak for each state, while hatched regions represent state which had significant biannual peaks. In all three eras, a North(early)-to-South(late) gradient is observed. States in white did not display significant periodicity. I collected monthly birth data for 100+ countries from the United Nations database, and digitized monthly birth data for each US state from 1931-2008 to understand the spatial and temporal variation in the timing of human births. My co-first author (Micaela Martinez) and I wanted to identify if there were any global patterns that could be discerned from analyzing such a large dataset. Above: Northern Hemisphere patterns of seasonal birth pulses color-coded by region. As with the US, birth pulses occurred earlier and higher latitudes, and later as you got closer to the equator. 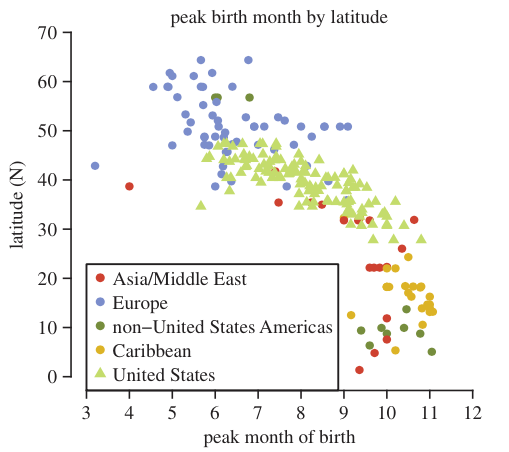 Note the increased noise in the variation of peak birth pulse in countries below 20 degrees N.
In addition to the variation in the timing of the birth pulse, we wanted to examine whether the strength of that pulse varied by location. Interestingly, the strength of the birth pulsed increased as you got closer to the equator. So while the pulses in the Southern US were later than those in the Northern US, they were 2-3x as strong. While this pattern is clear in the US, it does not hold for other developed countries in the Northern Hemisphere. We published this work in the spring of 2014 in the Proceedings of the Royal Society B, titled Human birth seasonality: latitudinal gradient and interplay with childhood disease dynamics. 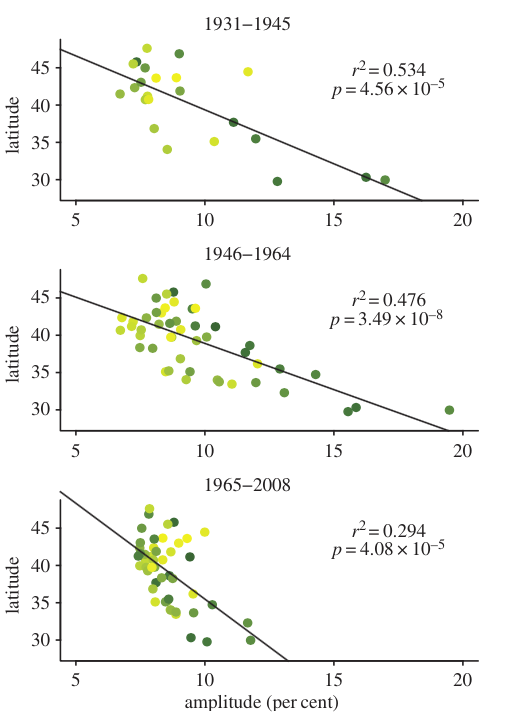 Right: Strength of the birth pulse (amplitude) for each state with significant annual pulses (colors match corresponding timing figures above) during the pre-baby boom (1931-1945), baby boom (1946-1964), and the modern era (1965-2008).